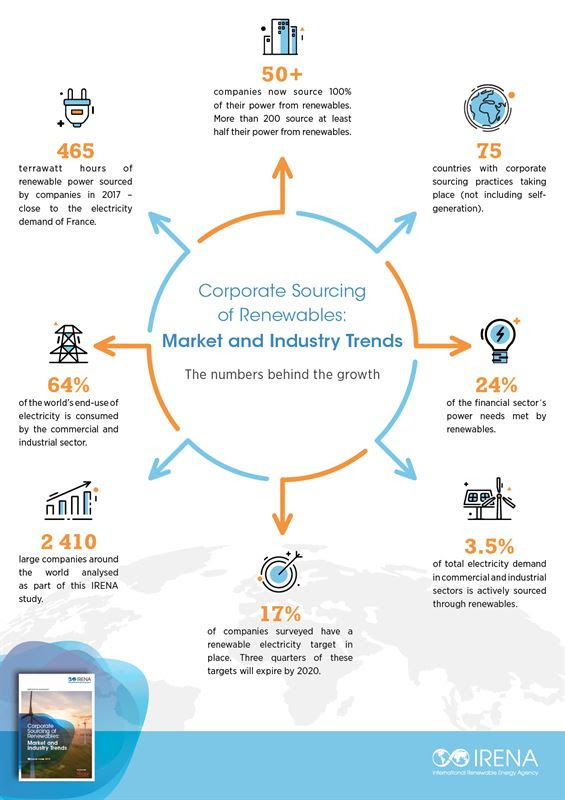 Companies in 75 countries actively sourced 465 terawatt hours (TWh) of renewable energy in 2017, an amount close to the overall electricity demand of France, according to a new report from the International Renewable Energy Agency (IRENA). With the continued decline in the costs of renewables, the report suggests, corporate demand will continue to increase as companies seek to reduce electricity bills, hedge against future price spikes and address sustainability concerns. The findings of the report, presented today at the Ninth Clean Energy Ministerial in Copenhagen, show that half of the over 2,400 large companies analysed are voluntarily and actively procuring or investing in self-generation of renewable electricity for their operations. Of the companies in the study, more than 200 source at least half of their power from renewables. Electricity self-generation is the most common sourcing model, followed by unbundled energy attribute certificates (EACs) and power purchase agreements (PPAs). View and download the Executive Summary of the report here. Previous Previous post: What’s the weirdest junk floating out at sea?